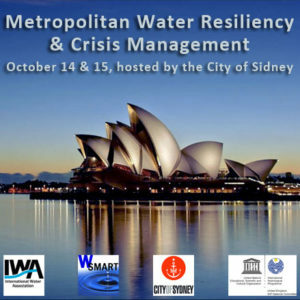 Organization – Within the context of IWA World Water Congress, Brisbane, 9 – 14 October, 2016, the workshop is organized at the initiative of the W-SMART Association with the collaboration of UNESCO-IHP, IWA Specialists Group on Water Security and Safety Management and the City of Sydney as its host. 1:00 – 5:00 pm Technical Tour: Sydney Park water reuse facility, Green Square Town Precinct & Central Park Water treatment facility. Includes take away lunch. Pickup and return to Customs House by Bus. Facilitated by David Parsons with W-SMART Delegates as Expert -Observers. 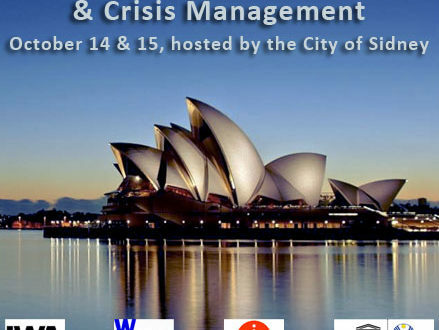 Chair: David Parsons, Adjunct Professor QUT Centre for Disaster Mgmt. Keynote: David Parsons, Executive Summary of the Exercise. Includes take away lunch. Pickup and return to Customs House with Bus.